similar limits on wine and matzo consumption at Passover Seders. shamefully, the biggest offender is a Jewish icon—the prophet Elijah. requirements encouraged by some Torah sages. Thank You for that update I missed it! I have wondered however, why is Bloomberg so concerned with what we eat and not the size of teachers paychecks! How can he spend so much time on this trivia but not with Mulgrew on contract decisions? wish I could take credit, but, no, I did nto write this. Thanks for giving me a real laugh with this satirical article! What next? 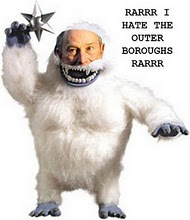 Will Bloomberg decide that the EASTER BUNNY is too fat, and put him on a diet next?????? Great satire! Couldn't stop laughing. As for the Easter Bunny, won't be put on a diet because it's Bloomberg's Sunday dinner.